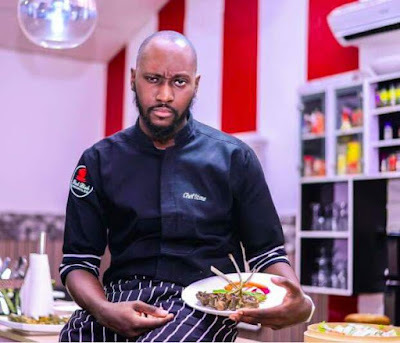 Chef Stone was born, Abiola Akanji on 29 January 1983. Abiola is a Nigerian celebrity chef, author and television personality, also known as "Chef Stone". One of Nigeria's top celebrity chefs, he has taught masterclasses at the GT Bank Food & Drink Fair and makes regular appearances as a guest judge on cooking competitions such as Oando ‘Teens Can Cook’. He is also the founder of Red Dish Chronicles. Chef Stone studied in London, majoring in business management at the London Metropolitan University. He partly worked in different restaurants where he picked up his culinary skills. He went a mile further by enrolling in the French Culinary Institute in New York where he was professionally trained as a Chef. In 2006, he completed a one- year graduate programme and was selected as a Project manager for the investment development team in Sainsburys Ltd, United Kingdom from 2007-2010. He successfully completed 5 new store openings and was later assigned as a duty Manager. He was an Executive Sous Chef at the Giotto Italian Restaurant and a Line Chef at Paramount Restaurant, both in London. In 2013, he started his own culinary school, Red Dish Chronicles. It is one of the most successful culinary schools in Nigeria, with branches in both Lagos and Abuja where passionate professional chefs inculcate the best culinary knowledge in students. He also has a collection of spices called ‘the Chef Stone Secret Spice’. He is the author of a book, 30 Easy Meal Ideas. His first very own recipe book, released in August 2017. His second book,The Dark Side Series, was a Christmas recipe album, released in December 2017. When Stone moved back to Nigeria in 2011, he also founded the Dreamblast enterprises; a group of small sized businesses. In March 2017, Stone was a guest judge at the annual Oando ‘Teens Can Cook’ cooking competition held in Lagos. Two months later, he was one of the guest chefs at the annual GTBank Food and Drinks Fair in Lagos. He was also one of the judges for the online Food Plating competition held by Supermart NG. He is happily married with a child and lives in Abuja. We are proud to celebrate this Nigerian celebrity Chef!